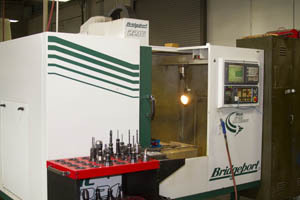 Our Bridgeport CNC mill that we use for custom manufacturing and die block construction. CNC milling machines are great machines for custom manufacturing projects. The difference between a CNC mill and a manual mill is that the CNC mill operates based on an operator programming the cuts required to make the desired product. 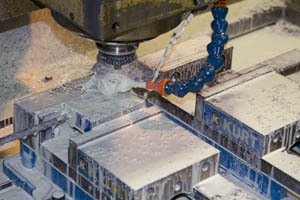 The CNC milling machine then cuts, drills, and tapers according to the programmed operations. CNC mills are faster than a regular manual mill, as they have the capability of holding multiple tools and quickly changing them, significantly reducing operation time. Our Bridgeport CNC mill, mid-cut of a die block. Our custom manufacturing capabilities with our CNC milling machines are quite vast. We’ve manufactured everything from die base plates to bodies of locking mechanisms. We can take your 3D CAD drawings, or make the drawings our self, and convert those into parts. Combined with our Laser Cutter and Wire EDM machines, our overall options from part conception to completion in custom manufacturing is tough to beat. For more information about our CNC milling machines, and custom manufacturing capabilities, give us a call at 1-800-345-2069. We’re located in Springfield, Oregon, and while we typically service custom manufacturing jobs within the state of Oregon, we’re always open for quote requests.